Interact with the Minions at Universal Orlando resort, rediscover your inner child at Walt Disney World® Resort and swim with dolphins at SeaWorld® Orlando, all in one place! A Disney vacation package has traditionally included two key things: a hotel room and park tickets. (A hotel room by itself is not a package – it’s called a “room-only” reservation.) You can also add a pre-paid dining plan to any package. Annual Passholders have been able to get a special package with a dining plan but no tickets for several years now, and in 2014 Disney started offering the same package to the general public. That “ticketless” package is not currently available online; you need to book it with a travel agent or over the phone with Disney. When Disney offers package discounts, usually they are calculated as a discount on the hotel portion of the package and are identical to a room-only discount offered at the same time; the tickets and dining plan are charged at full price. However, Disney sometimes offers exclusive promotional package discounts, particularly in the off-season, that do not have any room-only equivalent, where you get a discount on dining instead of (or in addition to) a hotel discount. Disney World packages have rules about advance payment, cancellations and changes that are usually much more restrictive than those associated with “room only” reservations. If you’re not sure about whether to buy a package vs. just booking your room and tickets separately, click here for information that should help you decide. —- Build and Book You Vacation Package Right HERE! For 2017, most of the prices for the various dining plans only went up by a few dollars, and the adult price for the deluxe plan actually went down a few dollars! The Premium Package and the Platinum Package have been discontinued. New benefits for 2017: the Quick Service Dining Plan and regular Dining Plan now include two snacks per person per day. Reduced benefits for 2017: Quick Service meals on all dining plans no longer include a dessert with lunch or dinner. The following merchandise and food discounts were removed: Portobello Country Italian Trattoria, Wolfgang Puck Café, Planet Hollywood, Basin, LittleMissMatched. 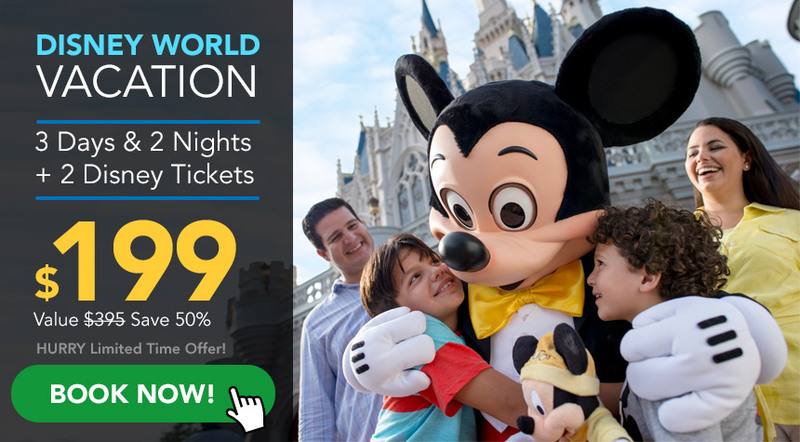 Disney’s Magic Your Way Package – The base package helps you experience the magic of a Walt Disney World vacation at an affordable rate. The package includes accommodations at a Disney-owned-and-operated resort hotel, and Magic Your Way base tickets for everyone in the group. Disney’s Magic Your Way Package Plus Quick Service Dining Plan – This package includes everything from the Disney’s Magic Your Way Package, and adds a dining plan that includes two quick service meals and two snacks per person, per package night, plus a resort refillable mug per person. You can choose from dozens of counter service restaurants across the Walt Disney World Resort. Disney’s Magic Your Way Package Plus Dining Plan – This package includes everything from the Disney’s Magic Your Way Package, and adds a dining plan that includes two meals (one table service, one quick service) and two snacks per person, per package night at more than 100 restaurants across the Walt Disney World Resort. This plan also includes a resort refillable mug per person. The first thing you need to bear in mind is that Disney REALLY wants you to have a 6days/ 5 nights vacation. For that reason, the Magic Your Way tickets included in your package are heavily discounted on longer (5 to 7 day) stays. Remember that tickets are usually the biggest single expense in your package, and 7 day tickets cost only a little more than 4 day tickets. So live it up — price out the longer vacation and you’ll probably be surprised how little the extra cost will be. For most people who buy a vacation package, the plain Magic Your Way Package (no dining) or the Magic Your Way Package Plus Dining will be the best value. —- CLICK to Build You Vacation Package HERE!